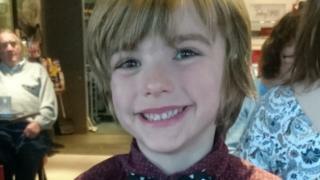 A seven-year-old boy is collecting supplies to give to rough sleepers during cold weather. Jacob Rabi-Laleh, from Maldon, Essex, decided to take action after seeing a group of homeless people taking shelter in Brighton while visiting the city. He is collecting blankets, hats, and other supplies and putting them in backpacks to hand out. Mother Stephanie Bannister, 28, said: "Every night after school he's trying to organise the whole thing." "He hasn't played with his toys for months - he's just been focussing on how to help the homeless now the weather is getting colder," she said. On Sunday, he is holding a "garage sale" fundraiser in Maldon as he currently does not have enough backpacks or blankets, Ms Bannister said. She said the family had faced homelessness in 2015 after long-running issues with their rented accommodation in Tiptree. "We used all our savings for the deposit, but as it got colder the walls dripped with mould. My partner and I became ill, and Jacob had lots of chest infections," she said. "In the end, we had to leave because of that. We were very lucky in that we could stay with both sets of parents, but if we hadn't had that, it could have been much worse. "It was only recently when I thought about the situation that I realised it must have affected Jacob more than we realised." Jacob said seeing people sleeping rough had made him "very sad". He has raised more than £235 through a GoFundMe page which will be used to fund items such as toiletries, tins of food and spoons. Among the items Jacob will be selling are some of his own toys. "I would rather have lots of homeless people happy than my own toys," he said.